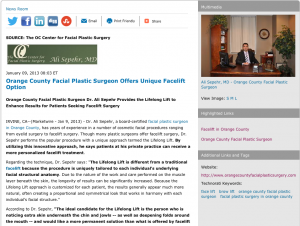 Orange County facial plastic surgeon Dr. Ali Sepehr provides the Lifelong Lift to enhance results for patients seeking facelift surgery. Irvine, CA – Dr. Ali Sepehr, a board-certified facial plastic surgeon in Orange County, has years of experience in a number of cosmetic facial procedures ranging from eyelid surgery to facelift surgery. Though many plastic surgeons offer facelift surgery, Dr. Sepehr performs the popular procedure with a unique approach termed the Lifelong Lift. By utilizing this innovative approach, he says patients at his private practice can receive a more personalized facelift treatment. Prior to a Lifelong Lift procedure, patients at Dr. Sepehr’s Orange County facial plastic surgery practice can attend a private consultation in which he will work with them to fully understand their goals and expectations. He will also conduct a separate preoperative meeting to make certain each patient is informed of everything he or she needs to know to ensure the safest, most effective procedure and recovery. After the procedure, Dr. Sepehr generally requests his patients return for frequent follow-up visits in order to assess their progress and review any necessary changes to their postoperative care programs. At the OC Center for Facial Plastic Surgery, Dr. Sepehr considers the Lifelong Lift an important component of all the rejuvenating procedures he offers his patients who desire a more rested, refreshed, and natural look. Ultimately, he says the Lifelong Lift – in conjunction with other procedures available at the practice including Brow Lift, Forehead Lift, and Eyelid Lift – allows him to more effectively help patients achieve their cosmetic goals. Dr. Ali Sepehr earned his medical degree at University of California, Los Angeles School of Medicine and is fellowship-trained in Facial Plastic and Reconstructive Surgery. He is published in a number of textbooks and facial plastic surgery journals, and he continuously devotes time outside his office to teach and mentor fellows, residents, and medical students from the University of California, Irvine Medical Center. Furthermore, Dr. Sepehr has received the 2010 Reuther Kris Conrad Merit Award for outstanding achievement in the field of research and perseverance for Facial Plastic Surgery, among other prestigious medical honors.